We are presently alongside the re-vamped Trinity Wharf, Cairns. The skyline has changed dramatically since our last visit two years ago. "Zac" the custom's sniffer dog has just slunk up the gangway after failing his training exercise, being unable to locate a planted drug scented decoy - maybe the lingering smell of Trobriand Island grass skirts was just too much. The last of the tall ships which made up the First Fleet, headed south the day prior to our arrival, so we were unable to share a beer and discuss old times. The past five months has seen as end to the constant tramp of feet on deck, which all the First Fleet vessels experienced - we only had to cope with traffic jams of canoes along-side. Much has happened since our last newsletter and departure from Sydney. 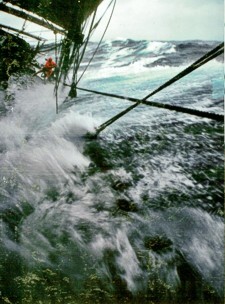 Gale bound on the fifth of June, the Heads dropped astern during the early hours of the next day. Sea-sick patches were in hot demand. After yet another record breaking passage to Lord Howe, with over two hundred miles in one twenty four hour period, we rolled at anchor off Ned's Beach. Everyone took the opportunity to explore the island and use their rusty leg muscles to peddle the perimiter of Lord Howe -still one of the world's most stunning islands. Heavy weather confronted us as we headed northeast to Vila - Eric's photo shows all. In the calm which followed the storm, we were under power for the first time since leaving Sydney. At dusk, the engine revs sounded strange and there was a loss of power. After diving over the side it was discovered that the propeller and shaft had become disengaged from the engine. During the long and dark night south of the Loyalty Islands, being shadowed and buzzed by an unlit French warship, we were able to contact Noumea (using our very best French of course) and arrange for a tug. In order to make the pre-arranged rendezvous with the tug, we were forced to utilise the Jolly Boat to tow us through the glassy sea (thank heaven for outboards). A favourable wind then carried us to Havannah Passage to pick up the tug. Up on the slip again (sixth time in two years) we found that the propeller shaft was fractured just short of the stern bearing. Working around the clock, we had the shaft out, dismantled, machined, welded and re-assembled and afloat again within four days - a fantastic effort by crew and voyagers alike. Arriving in Vila we found, that the over exaggerated riot was well and truly over - just a few boarded up shop windows. Sailing north to Santo we enjoyed excellent diving, visits to custom villages, all the usual fun of cascading waterfalls, custom dances and climbing mountains, guided by the fleet footed locals, whose standard reply was...."Only one hour away". On the beach at Tikopea, young eager boys waited in the surf anxiously enquiring if "Mr Denis", "Mr George", "Mr Kevin" etc had sent their long awaited parcels. They were not disappointed. Tikopean canoes were alongside, eager to trade. Gone are the days of clay pipes, sarongs and stick tobacco. Watches and tape recorders are now hot trading items. Chief Tafua ("Daddy" to his friends) and his entourage of relatives came to dinner as usual. Beer, betelnut and cigarettes disappeared into their red stained mouths. The decks resounded to their stamping war dances, as other Tikopeans with kerosene lamps on poles in their canoes, hunted for flying fish. Whilst approaching the Santa Cruz group, we experienced some of the 570 inches which falls annually. It just pelted down cats and dogs. Thank God for radar. The clouds parted and the rim of Tinacoola volcano was revealed. As we approached the shoreline a mini atomic mushroom shaped cloud arose from the crater. The twilight show as we were having dinner on the poop deck was quite exceptional, as red hot rock and lava cascaded down the slopes and fizzled into the sea. 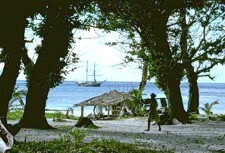 The Solomon Islands were nor without problems. Honiara, like us was awaiting the arrival of a fuel tanker. There was only enough diesel to run the town generators for four hours. Everyone heaved a huge sigh of relief as the tanker appeared over the horizon. Adelaide Skin Divers went home laden down with all manner of carvings from Morova Lagoon. Ngoosangnoosas will no doubt be adorning the walls of many an Adelaide home. Kevin Deacon, the well known underwater photographer joined us in Honiara to photograph the Solomons from the ship for his forthcoming book on diving in the South Pacific. New dive locations were found, as well as an intact US Marine Hellcat. Thanks to Jeanne James of the ABC for her efforts and broadcast on Melbourne radio, we were able to distribute boxes of primary school books and equipment to many of the islands we visited. These were invaluable and very gratefully received. We have been inundated with underwater celebrities this year. Peter Stone, the Melbourne based photo-journalist joined us at Gizo. He dived deep and flew high in Rabaul. We look forward to seeing his articles and photos in print. Ann Fielding and Ed Robinson from Hawaii, who have written books in collaboration, joined us for our first visit to the Hermit Islands in the north of PNG. 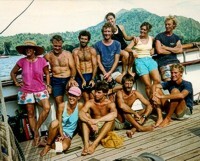 Cousteau has made a soon to be released documentary film on these islands. They lived up to all expectations and must be one of the best diving grounds left in the world. The waters were crystal clear with unbelievably prolific fish life. Every dive was a new experience, especially the underwater waterfall. Onward to the Trobriand and Marshall Bennetts, some of our old favourites which we first visited in 1977. A current article in Australian Geo, written and photographed by Phil and Liz Castleton, two of our former crew, delighted the locals who had a wonderful time identifying everyone in the photographs. At long last we seem to have come up with the perfect fishing lure. Shredded fibreglass rice bags are all the go. After catching five fish in one day, including a 4 feet 10 inch baracooda, we decided to bring the line in for the day. Louisiade locals showed us the art of catching crayfish in shallow water at night. They make it look so easy. Ray only caught feelers. After experiencing light airs and calms since the Solomons, we returned to Australian waters with a vigourous passage between the Louisiades and Cairns across the Coral Sea, averaging 7.5 knots over the three day passage. Ahead of us lie the Whitsundays where we will be spending Christmas. With fair winds, we should be joining the 201st Australia Day celebrations on 26 January. We are hopirg for a grandstand view as Murray and Connor race the 12 metres on Sydney Harbour. A brief stopover in Sydney to reprovision before pointing our bow towards Hobart. Still a few berths available for those who want to experience the magic of Port Davy and the south west. Enquiries should be directed towards Ted, our man in Tasmania, PO Box 388, Sandy Bay, Tas 7005, Phone (002) 23 6206. Enclosed with this newsletter is our cruise schedule for the Pacific as well as other currently scheduled voyages. Book early. Do'nt be disappointed. Brian Young, the magistrate for Pitcairn Island, was overjoyed when we spoke to him on the telephone at Adamstown recently. The Pitcairners: are looking forward to welcoming us in early 1990. It seems that the "anchorage" at Bounty Bay will be shared by "Bounty" and the schooner "Sundancer", who are also planning a voyage to the island. 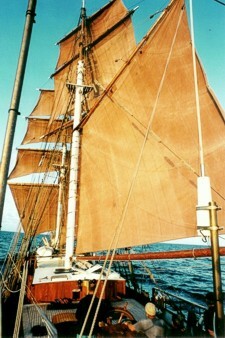 Seasons greetings to you all from "Eye of the Wind" and her crew.